“Friday Night Lights” producer Brian Grazer and Golden State Warriors superstar Kevin Durant are teaming for a scripted dramatic series for Apple. 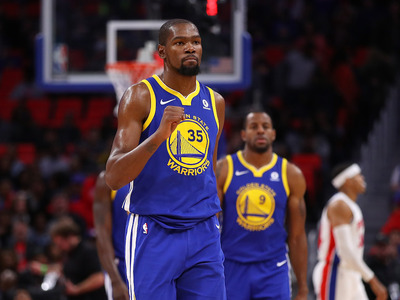 The series will be based on Durant’s childhood playing basketball at an early age in Washington, D.C.
Apple’s leap into scripted television is attracting an NBA superstar and a major TV and film producer. Golden State Warriors player Kevin Durant and “Friday Night Lights” producer Brian Grazer will team for a dramatic scripted series for the tech giant, Deadline first reported. The series, called “Swagger,” is inspired by Durant’s time playing Amateur Athletic Union (AAU) basketball in Washington, D.C. at an early age. Grazer said he hopes to capture the essence of “Friday Night Lights,” an NBC drama that focused on the lives of small town Texas football players that aired from 2006 to 2011. Apple has recently been making moves in the scripted series world, even willing to drop a reported $US1 billion this year on programming. In January, The Hollywood Reporter broke that Apple had acquired a 10-episode comedy starring Kristen Wiig and executive produced by Reese Witherspoon. “Swagger” would also join the likes of the Steven Spielberg-produced “Amazing Stories,” among other shows, in Apple’s move to challenge Netflix, Hulu, and Amazon for the original content streaming crown. And while Apple is bankrolling this project, here’s a fun aside: Durant and Grazer were actually brought together by Google. The pair reportedly met at the exclusive “Google Camp” gathering, started by Google cofounders Larry Page and Sergey Brin, which has been called the “Davos on the sea” for bringing together VIPs across tech, media, and fashion.